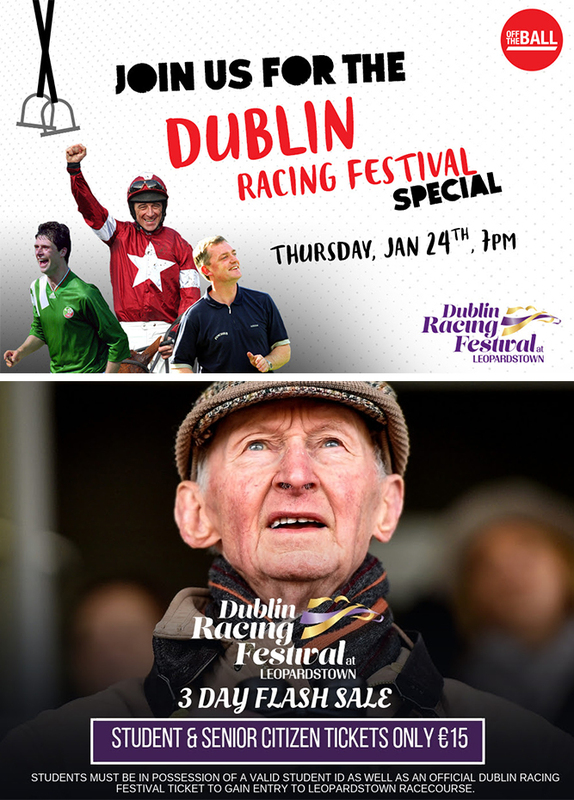 Leopardstown Racecourse – 2 weeks until Dublin Racing Festival – giveaways and exciting news inside! Dublin Racing Festival is two weeks away and to celebrate we have teamed up with Ireland’s best sports radio programme, Off The Ball ahead of their sold out, Dublin Racing Festival Roadshow in the Sugar Club! With guests on the night including Davy Russell, Rachael Blackmore, Niall Quinn, Nicky English, Kevin Kilbane as well as hosts Ger Gilroy, John Duggan and Jonny Ward it promises to be an excellent night! Tickets are completely sold out but we’ve got 2 to give away to one lucky reader! Simply click the image above and fill in your details to enter. Winner will be chosen on Tuesday 22nd January. Best of luck! Rewards4Racing – Hurry, your last chance to win hospitality at The Cheltenham Festival!